Bahrain is preparing to levy 5 per cent value added tax (VAT) from January 1, 2019, following the introduction of the tax in GCC states UAE and Saudi Arabia in 2018. During a meeting held at the ministry of Finance and National Economy on Tuesday, officials confirmed that they will “review the mechanisms of applying VAT during the trial period for its launch” and that it will continue to organize and participate in a series of workshops for companies and institutions to raise awareness of the technical, legal and procedural aspects of the tax. Sheikh Salman bin Khalifa Al Khalifa, minister of Finance and National Economy, also stressed that the government agencies will “ensure the proper implementation of VAT procedures from the first day of its launch during the trial period, taking into account the importance of market stability”, the official Bahrain News Agency (BNA) reported. Earlier this month, Bahrain’s ministry of Finance announced that VAT will be introduced in a phased manner through transitional mandatory registration thresholds, consultancy PwC revealed. According to the regulations, businesses earning over BD5m ($13.2m), will have to be registered by January 1, 2019, while those making over BD500,000 ($1.3m) and BD37,500 (over $99,730) have to be registered by July 1, 2019 and January 1, 2020 respectively. Businesses below the mandatory registration thresholds for 2019 are not required to register next year while those wishing to voluntarily register in 2019 must exceed the voluntary registration threshold of BD18,750 ($49,860). Large businesses will file tax returns on a monthly basis and all other businesses will file quarterly. However, for 2019, registered businesses will have only three or four tax periods, depending on turnover. Tax returns will be due on the last day following the month of the end of the tax period. 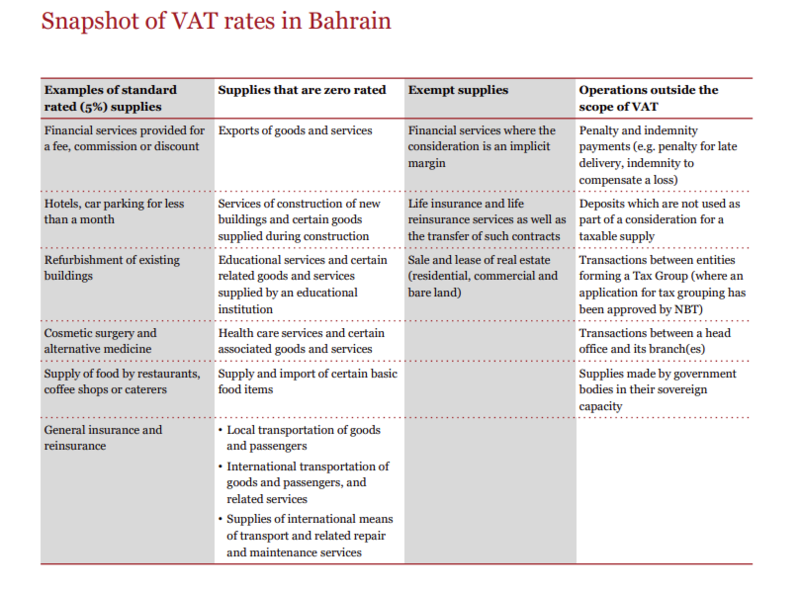 Bahrain’s VAT law also sets out a number of differences from the VAT laws that have been already been implemented in Saudi Arabia and the UAE. Some of these key differences relate to the zero-rating and VAT exemption provisions in the law, PwC stated. “In particular, it is expected that Bahrain will apply the zero-rate on basic food items, the construction of new buildings, education and healthcare services, local transport services, as well as oil and gas and derivatives,” it said. “The sale and lease of real estate as well as certain financial services (ie those with an implicit fee) and life insurance/reinsurance will be exempt from VAT. Financial services provided for an explicit fee including account management, certain trade finance services and fund management will be subject to standard rate VAT. Standard rate VAT will also apply to non-life insurance/reinsurance,” the report added. The regulations contain certain “business-friendly” provisions aimed to reduce the burden of VAT on businesses and certain taxpayers, PwC stated. • Tax invoices being acceptable in Arabic or English. “The requirement in Saudi Arabia to produce tax invoices solely in Arabic caused considerable difficulty for many businesses with standard ERP systems,” the report stated. • The acceptance of a bank statement as a valid tax invoice, subject to some minor amendments. “This will be welcomed by banks as this should reduce the burden to produce a separate tax invoice for bank accounts or to significantly adapt such statements to comply with the rules for standard tax invoices,” said PwC. • Provisions allowing businesses to apply to defer the payment of VAT on imports of goods to their next tax return. “This will be welcomed by large importers who may otherwise be in a regular VAT refund position,” the report said. • Provisions allowing businesses who export more than 50 per cent of their turnover and who expect to be in a regular VAT refund position to request that the domestic reverse charge mechanism will apply on certain local purchases. This will reduce the cash-flow burden of VAT refunds for these exporters, according to PwC. However, the consultancy also warned that VAT will still be complex for certain sectors, particularly financial services and real estate. “As with most countries with VAT, banks and financial institutions will make both taxable and exempt supplies, and great care will be needed to compute the recoverable input tax correctly,” it stated. Information courtesy: PwC Bahrain’s VAT law also states that the penalty for tax evasion is imprisonment and a fine. Administrative penalties will also apply in case of specific violations, such as the late submission of a VAT return or failure to register for VAT. Similarly to Saudi Arabia and the UAE, penalties will either be a percentage of the tax or a fixed penalty.